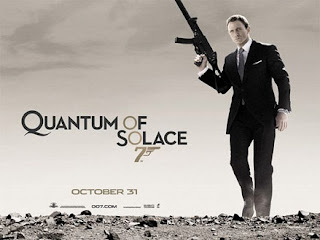 A grim faced 007 is on the warpath in the latest James Bond movie Quantum of Solace, the sequel to the box office hit Casino Royale staring Daniel Craig as fictional spy. Bond shows no mercy as he crosses Europe and South America to discover why the women he loved betrayed him before she died. He battles evil eco-terrorist Dominic Greene who wants to install an exiled general in what is supposed to be Bolivia in exchange for land with natural resources, in a complex web of diplomacy and deceit.